Using a sauce gun, deposit the pot de crème mixture into the egg shells, about 1/3 of the way up. Place in the refrigerator and allow to set for 10 to 15 minutes. Pour into the egg shells the Brown Butterscotch Pudding, on top of Chocolate Pot de Crème and allow it to set in refrigerator for 5 to10 minutes. Spread a thin layer of the tempered couverture onto a Clear Transfer Sheet (226095) and allow it to set slightly. Use a round cutter to cut out discs. Then, using a slightly smaller round cutter, cut out a hole in each disc. Allow to crystallize completely. Break up the Whiskey Cordials in to pieces and place inside egg shells in desired location. Sprinkle with Chocolate Powder and decorate with gold leaf pieces. 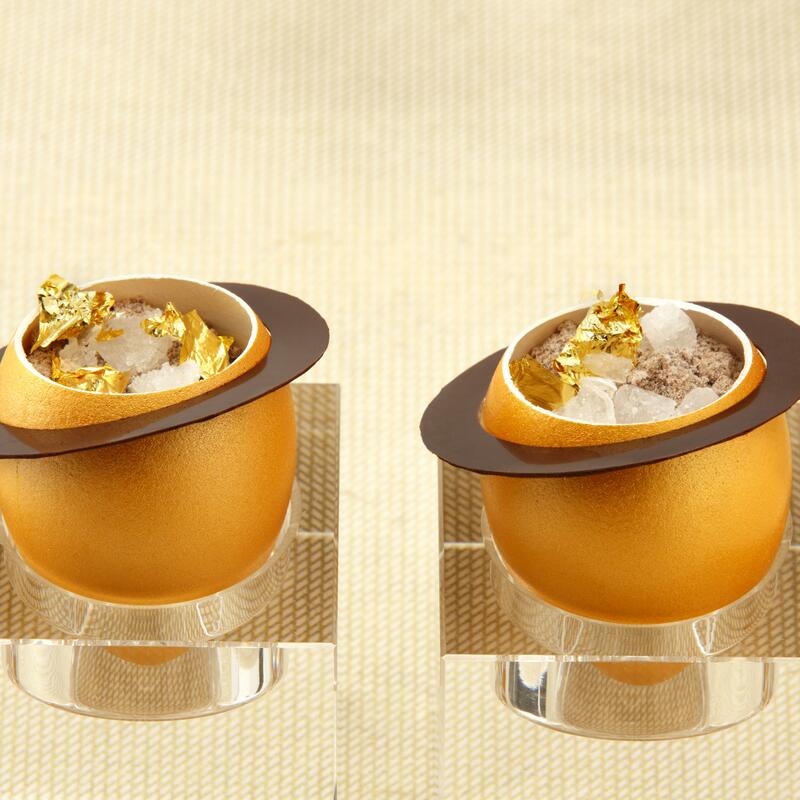 Garnish each shell with a Chocolate Ring. Spread the cornstarch out on a sheet pan lined with parchment paper and dry in an 190ºF/87ºC oven overnight. The next day, sift the cornstarch into a foil lined frame on a flat sheet pan. Flatten the cornstarch so it is level with the frame and pack the cornstarch down with a wooden block. Form impressions by pressing desired mold firmly and steadily into cornstarch. Keep plenty of starch to the side for later. Combine bourbon and both bitters and warm slightly in microwave. Place sugar and water into a pot and cook over high heat to 244ºF/118ºC. Once the temperature has been reached, remove from heat and add in the warmed whiskey and bitters. Gently mix in, do not over agitate. Use sauce gun to pour the sugar mixture into cornstarch molds. Sift more dried cornstarch on top to cover molds. Lay a sheet of aluminum foil on top of the cornstarch. Place another sheet pan on top of the frame and wrap in plastic. Allow to rest undisturbed for a minimum of 8 hours, then quickly and gently flip the frame and allow to rest for an additional 6 to 8 hours. Remove cordials carefully, brush off excess cornstarch, and store in an air tight container. In a saucepan, bring the heavy cream to a boil. Add the pot de crème mix and return the mixture to a boil, whisking constantly for 2 to 3 minutes. Dispense as desired. Place the butter in a saucepan to slowly melt and then brown. Whisk the dark brown sugar into the browned butter and allow it to melt. Remove from heat and set aside. In a bowl, whisk the first amount milk, eggs, and cornstarch together. Add the second amount of milk to the pot with the dark brown sugar and return to a boil. Temper milk mixture into the egg mixture and whisk until smooth. Return to the pot and bring to a boil while continuously whisking. Reduce and simmer the mixture until it becomes thick while continuously whisking. Remove from heat and whisk in the whiskey, the vanilla extract, and the salt. Pour into the egg shells on top of Chocolate Pot de Crème and allow it to set in refrigerator for 5 to10 minutes. Place the malto in a food processor. Melt the chocolate and add. Pulse the machine and scrape the sides and bottom as needed. Sift through a tamis.